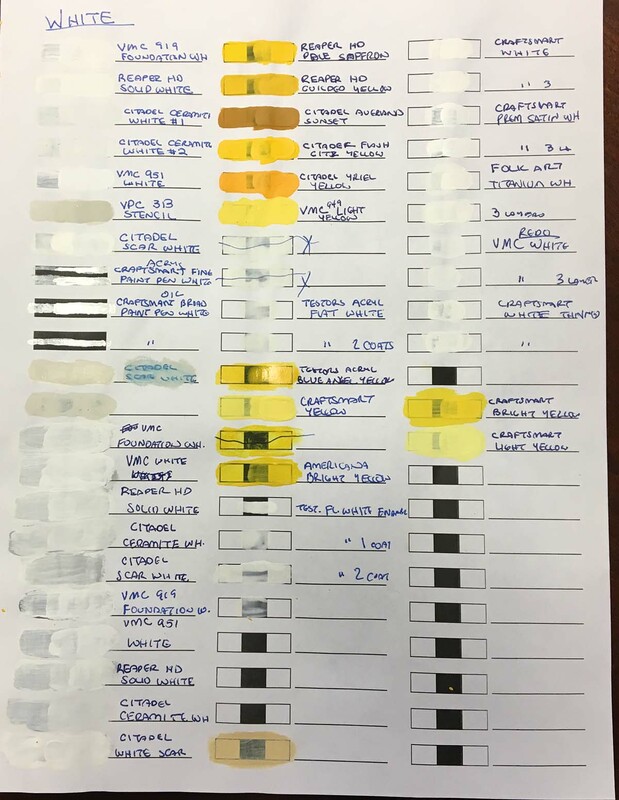 In preparation for painting a Zulu Wars British Force, I tested the 11 yellow acrylic paints I own for coverage over white and opacity (ability to cover black). Obviously this test is not comprehensive. I’ll probably add to it if I get more paints. I’ll add photos later. I painted a single layer, double layer and triple layer of each paint on a sheet of white 24 lb paper. The paper had solid white areas to test the paint’s coverage and solid black areas to test the paint’s opacity over a black basecoat. I used a Rosemary & Co. flat brush. Now, I know that you don’t normally use yellow over a black basecoat. But this was a great way to test overall opacity. And shockingly, one of the yellows almost covered black in one layer. I had already slightly thinned my Citadel paints when I decanted them into dropper bottles. The remaining paints were used “out of the bottle” and not thinned except as noted below. The craft paints were thicker than game paints, so I thinned them to Vallejo consistency with Liquitex Airbrush Thinner (a great thinning medium). A (b) means the paint has a distinctive brown hue. An (o) means the paint has a distinctive orange hue. Vallejo Model Color 949 Light Yellow B+/A/A/A The best yellow I own. It has the best opacity of any of the yellows; it almost covered the black in one layer. Liquitex Cadmium Yellow Medium C/A-/A/A Nearly identical to Citadel Flash Gitz Yellow and very close to Reaper HD Pale Saffron. It rates C/A-/A/A and is better than Flash Gitz Yellow and Pale Saffron. Thinned, it rates C-/B/B+/A. 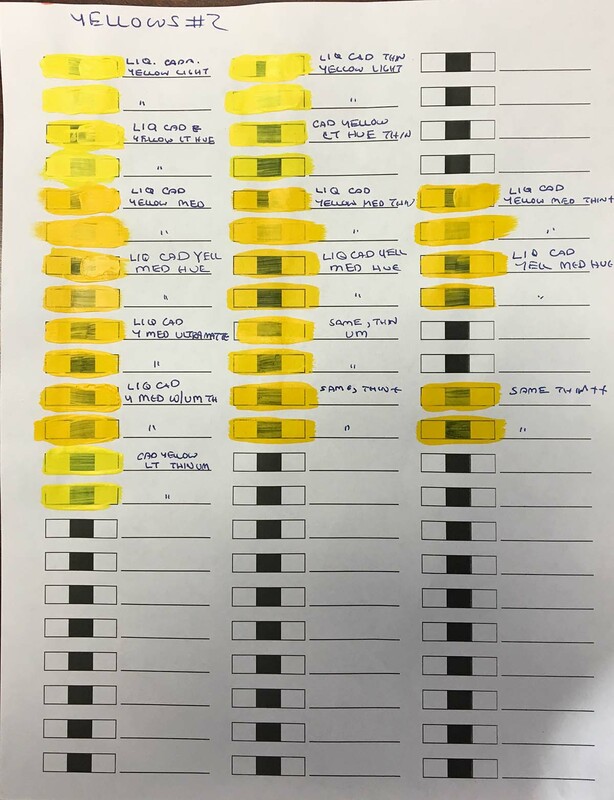 The Cadmium Yellow Medium Hue rates D/C/B/A. Craft Smart Matte Yellow C/A-/A/A A very cheap house brand by Michaels (70 cents for a 2 oz. bottle) that has surprisingly good performance. In fact, it’s the second best yellow in the test. Close to VMC 946 Light Yellow. Thinned, it drops to C/B/B/A, which means it was unable to completely cover black with 3 coats. Liquitex Cadmium Yellow Light C/B+/A-/A Richer version of VMC 949 Light Yellow. Thinned with my new magic thinner (Liquitex Matte Medium and distilled water in a 1:4 ratio), it rates C-/B/B+/A. It’s inferior in opacity to VMC 949 Light Yellow, but it is a richer color. The Liquitex Cadmium Yellow Light Hue was considerably worse in opacity – D/C/C+/A. Thinning it made it a D-/C/C/A. Craft Smart Matte Bright Yellow C/B/B/A Similar to Reaper HD Saffron, but lighter. Thinned, it drops to D/C/B-/A, which means it was unable to completely cover black with 3 coats. Craft Smart Matte Light Yellow C/A-/A-A Another surprisingly good craft paint. Lighter than VMC Light Yellow. Thinned, it drops to C/B/B/A, which means it was unable to completely cover black with 3 coats. Reaper HD Pale Saffron D/B/B/A A disappointing paint. Poor opacity despite being an HD paint. Warmer yellow than VMC Light Yellow. Reaper HD Guilded Yellow D/B/A/A Kind of a light mustard yellow color. Decent yellow, but inferior to VMC Light Yellow and Craft Smart Yellow. Citadel Averland Subset B/A/A/A (b) A very brownish yellow. Opacity comparable to VMC Light Yellow. If you want a brownish yellow, this is a good option. Citadel Flash Gitz Yellow C/B/B/A An average yellow. Good coverage, mediocre opacity. Citadel Yriel Yellow C/B/A-/A (o) An orange yellow. A good option if you want an orange yellow. Testor’s Model Master Acryl Blue Angel Yellow F/C/B/A A mediocre paint for brushing. Americana Bright Yellow F/C/C/A Very poor opacity. Similar in color to VMC Light Yellow and Craft Smart Yellow. 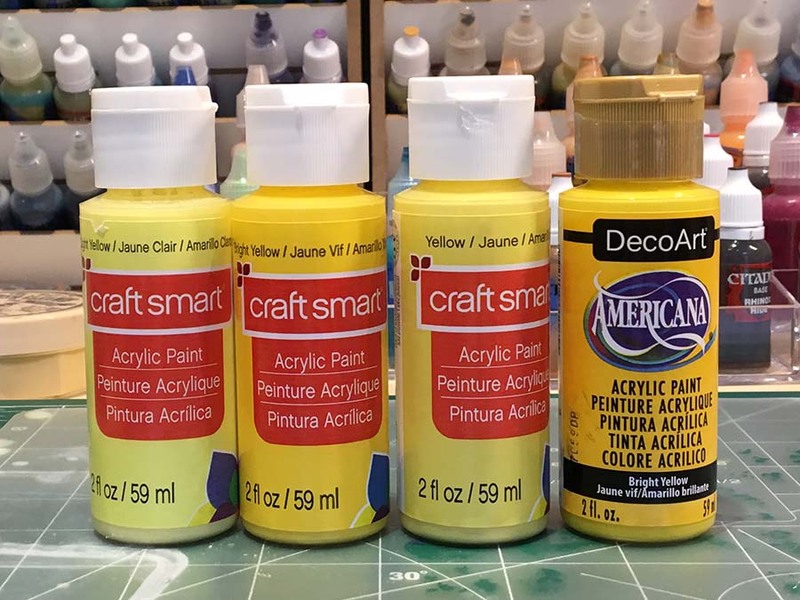 The Vallejo Model Color 949 Light Yellow was the best color in the test, but the Craft Smart Matte Yellows did surprisingly well. Reaper HD Yellows were disappointing.